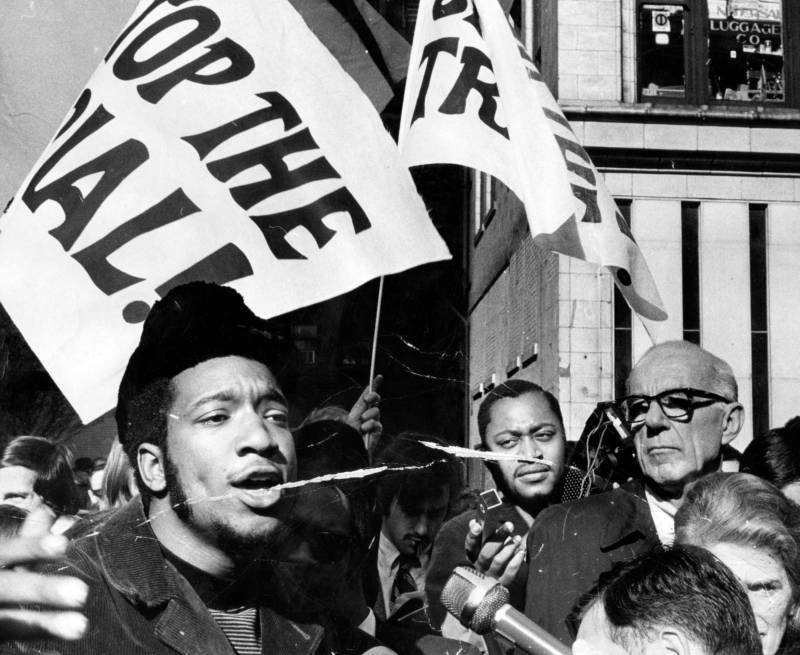 Fred Hampton, left, at a rally against the trial of eight people accused of conspiracy to start a riot at the Democratic National Convention, Oct. 29, 1969. In the very early morning hours of Dec. 4, 1969, within the span of about ten minutes, 100 shots were fired into the apartment in which Black Panthers Fred Hampton and Mark Clark were asleep. 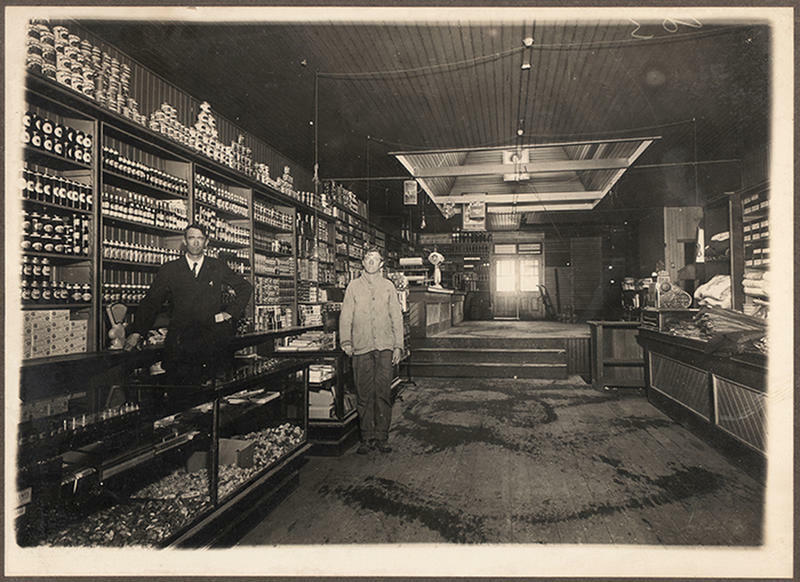 Police at the time claimed that their officers were fired upon in a hail of bullets from the inside first, but ballistics would prove otherwise. Police indicated holes on the inside front door frame in an attempt to cover up what really happened by claiming gunfire came from the inside. But as it turned out, these were actually just holes from nail heads. Indeed, it became clear that a massive cover-up and conspiracy was afoot. Fred Hampton was a very intelligent child. He finished high school with honors and entered college to study law, but then he began to see what injustices African Americans in the 1960s experienced. As a natural leader, Hampton organized a youth group within the National Association for the Advancement of Colored People, to improve recreational facilities and schools within African American communities. Meanwhile, the Black Panthers, which had been established just a few years prior with the goal of documenting police abuse against African American citizens, caught Fred Hampton’s eye. Hampton was attracted to the militancy and discipline inherent in the Black Panthers. But he was also won over by their efforts to help the community through food cooperatives and free health clinics. The Black Panthers hovered in a sort of paradox between being branded as a militant group and also one that aimed to educate and support their communities. Hampton testifies at a meeting on the death of West Side men in 1969. The primary goal of the Black Panthers though was really to end police brutality and the blatant police violence against African Americans, which, of course, didn’t sit well with Chicago cops nor with Chief J. Edgar Hoover of the FBI. One of Hampton’s primary achievements while in the Black Panthers was brokering a peace agreement between rival gangs of various ethnicities around Chicago. He was consequently a rapidly-rising star in the Black Panther Party; at the time of Fred Hampton’s murder in 1969, he was just 21-years-old but would have soon become a member of the Black Panther Party’s Central Committee as Chief of Staff – a national post. “We might not be back. I might be in jail. I might be anywhere. But when I leave, you’ll remember I said, with the last words on my lips, that I am a revolutionary,” Hampton once famously declared. Fred Hampton also brokered a merger of the Black Panthers with various political organizations around Chicago and with even former gang members and subsequently united African Americans with Italians, Latinos, and white people successfully. This attracted the attention of not just the FBI, but Chicago police, the Cook County State’s Attorney Office, and more. The irony, though, was that the FBI’s own paid informant, a two-time felon hired to spy on Hampton by becoming his bodyguard reported to J. Edgar Hoover that the primary role the Black Panthers played in Chicago was simply to feed hungry school children. The fact that this narrative didn’t fit the one Hoover had conjured didn’t sit well with him. Hoover instructed the informant to “find” anything that indicated the Black Panthers wanted to stir violence and hate. “The Black Panther Party stood up and said that we don’t care what anybody says. We don’t think fighting fire with fire is best We think fighting fire with water is best,” Hampton once said. 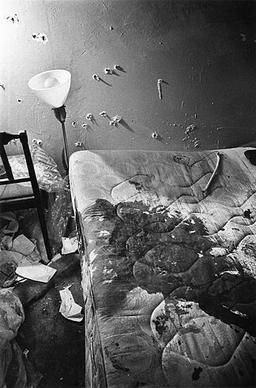 Hampton’s mattress soaked with his blood after his assassination at the hands of the Chicago police. But the informant was able to give Hoover exactly what he needed in order to silence Fred Hampton and all he stood for. The informant provided a “map” to “illegal” guns in the apartment, as well as an illustration of Hampton’s bedroom. The FBI then supplied Chicago Cook County State’s Attorney Edward Hanrahan with this information so that the police could undertake the execution. The night before the murders, that same informant slipped secobarbital, a powerful sleep drug, into Hampton’s drink so that he wouldn’t wake during the raid. The police and the FBI were going to be certain that Fred Hampton was dead. Mark Clark, the Minister of Defense for the Illinois Chapter of the Black Panther Party, remained posted as a guard in the apartment. He sat in a chair with a shotgun, but he was killed instantly, and the only shot fired by the Panthers that morning was the reflexive finger-pulling on the trigger of the shotgun as he died. It wasn’t even pointed toward the front door. 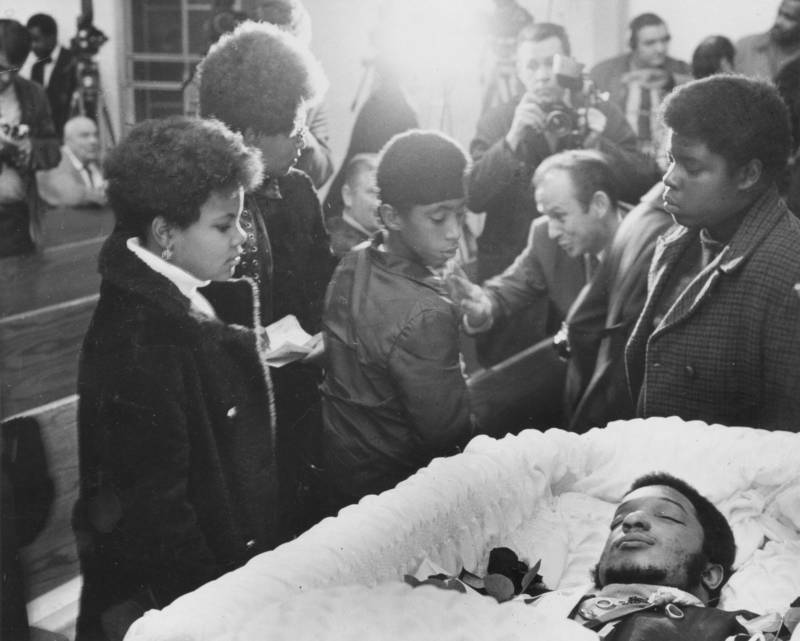 Mourners pass by the coffin Fred Hampton at his memorial service on Dec. 9, 1969. Hampton was seriously wounded in the shoulder after the 100 rounds were fired by police. According to his fiancee, who was with Hampton, and another Panther who’d slept in another nearby bedroom, a barely conscious yet still living Hampton was dragged into the hall of the apartment by a couple of officers who fired two shots at point-blank range at Hampton’s head. After they killed Hampton, seven remaining Black Panthers were shot, seriously wounded, and beaten, then taken to the street below and charged with “Aggravated assault” and “Attempted murder” of the cops, as well as “Armed violence.” All of these charges were later dropped. 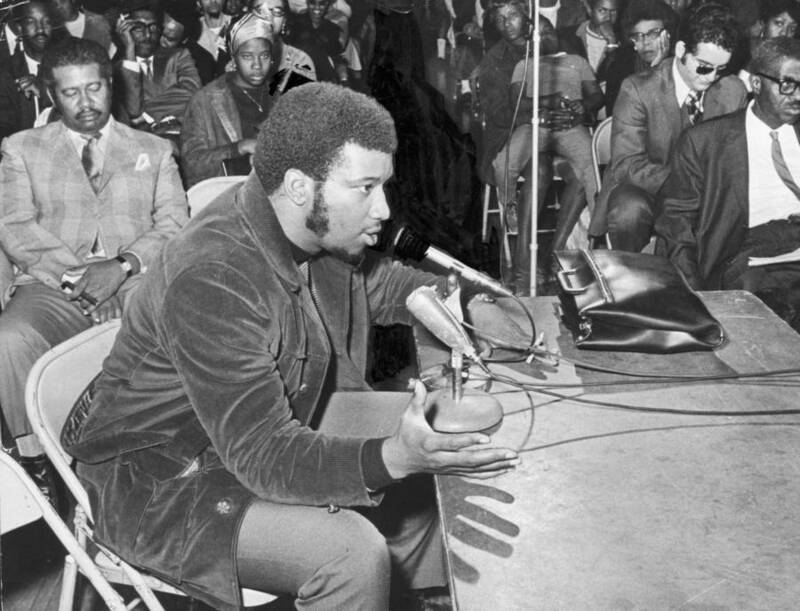 Later evidence showed that the orchestrated killing of Fred Hampton was one of many illegal operations conducted by the FBI’s Counter Intelligence Program (COINTELPRO), which had existed since 1956. The program was promptly shuttered a few years after this incident, though its methods continue today within the organization. Its tactics included psychological warfare, forging documents, perjury, withholding evidence, and phone tapping to name a few. Some of its most famous targets included Martin Luther King, Jr. and Malcolm X, and recent evidence showed that the same kinds of illegal tactics are still used today against groups like Black Lives Matter. It was discovered that police fired 82 to 99 shots where the BPP had fired but one, and not even at the door. But the evidence about all of this only came to light after some activists broke into a Pennsylvania FBI office, wherein they found the coverup and the COINTELPRO documents surrounding it. Still, nobody was arrested for the murders, even after hundreds of FBI files were released over the next decade. It took a civil lawsuit to get anything out of the federal government: $1.8 million for the surviving family members of both murdered activists in 1983. As for Hanrahan, his future political career — something he truly cherished — vanished nearly immediately. Meanwhile, Hampton’s son, Fred Hampton Jr., born just two weeks after his father’s assassination, also became a militant activist. Hampton Jr. went to prison for firebombing a grocery store in protests of the acquittal of the L.A. cops who beat Rodney King.